Hi there! You may have heard of Iapetus, a large satellite of Saturn which orbits very far. Today I will tell you about its equatorial ridge. This is the opportunity for me to present you Testing models for the formation of the equatorial ridge on Iapetus via crater counting, by Amanda L. Damptz, Andrew J. Dombard & Michelle R. Kirchoff, which has recently been accepted for publication in Icarus. its rotation is synchronous. Like our Moon, it is locked in the synchronous 1:1 spin-orbit resonance, constantly showing the same face to Saturn. Beside this, Iapetus is a large body (diameter: 1,470 km), which orbits at 3.5 millions km from Saturn (for comparison, Titan orbits almost thrice closer), with an orbital eccentricity of 0.028, very close to the one of Titan. It has an unexpectedly high orbital inclination, i.e. 15.47° with the equator of Saturn, and 8.13° with the Laplace Plane. We should imagine the proto-Saturn nebula, from which Iapetus has probably been formed. 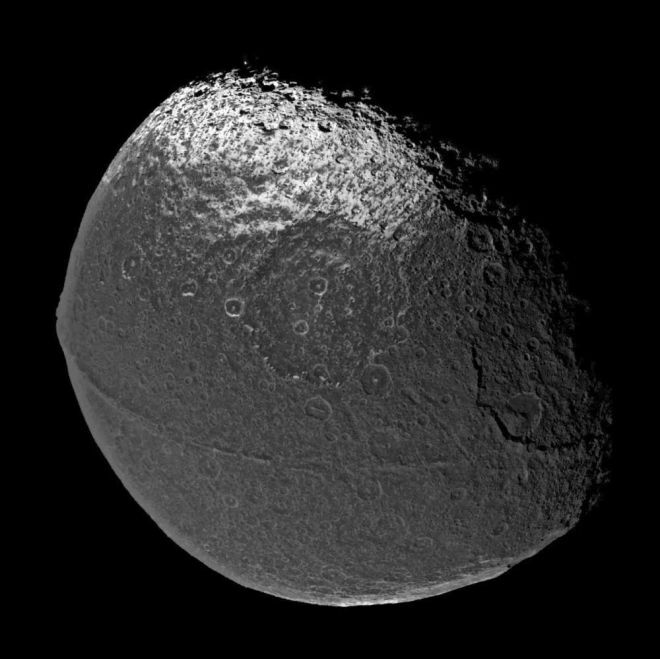 It was pretty much like a disc, but distorted by the Sun if you were far enough from Saturn, which is the case for Iapetus. What I mean is that the gravitational action of the Sun tends to shift the equilibrium orbital plane from the equatorial one, this is why we need to distinguish it, and we call it the Laplace Plane. In that case, the orbital inclination of Iapetus with respect to the Laplace Plane should be very small, but it is not. This probably contains an information on the history of Iapetus, but we do not know which one yet. Let me go back to the rotation. Iapetus is so far from Saturn that it needs almost 80 days to complete one revolution, and 80 days for a rotation, since it is synchronous. This is the largest known spin period for a natural satellite in the Solar System. As most of the satellites of Saturn, our knowledge of Iapetus made invaluable progress since 2004 thanks to the Cassini spacecraft, which imaged it. It confirmed the two-tone coloration, and detected a mountainous equatorial ridge. The Cassini images showed a 20 km-wide mountainous ridge, which is very close to the equator. So close that it is hard to believe it appeared there by chance. It is present on the dark hemisphere, while isolated equatorial mountains can be seen on the bright side. Some peaks reach 20 km. Material from impact generated debris. We can see that some of these scenarios propose an inner (endogenic) cause, while others propose an outer (exogenic) one. Almost all of them suggest an early formation of the ridge, except the last one. One way to date a geological feature is to count its craters, and this is where this study intervenes. Its first product is a database of 7,748 craters ranging from 0.83 to 591 km in diameter. When an impactor reaches a planetary surface, it creates a crater. If one day geological processes are strong enough to create a tectonic feature, then it may at least alter the crater, or even hide it. If we see an uncraterized geological feature, that means that it is pretty young. We could even try to give it an age in estimating the evolution of the cratering rates over the evolution of the Solar System. By the way, the early Solar System was very intensively bombarded, with an episode of Late Heavy Bombardment occurring between 4.1 and 3.8 billions years ago. Bombardments still happen nowadays, but are much less frequent. This systematic search for craters was assisted by the commercial software Esri’s ArcGIS, supplemented by the dedicated add-on Crater Helper Tools. The first result is a database of 7,748 craters. But the main question is: what can we say about the ridge? The authors observe a depletion of large craters, i.e. with a diameter bigger than 16 km, in the ridge, which would be consistent with a pretty recent formation, and thus would favor the scenario of a ridge created by the debris of an impact. Nevertheless, the authors are prudent with this conclusion, they seem to suggest that the resolution of the images and the risk of saturation of small craters (when you are heavily bombarded, new craters destroyed ancient ones, and the overall number does not increase) do not permit to discard a scenario of early formation of the ridge. Further studies will probably be needed to reach an agreement on the origin of this mountainous equator. and the ResearchGate profile of Michelle R. Kirchoff. Hello everybody! Today, I will tell you on the dynamics of the Alkyonides. You know the Alkyonides? No? OK… There are very small satellites of Saturn, i.e. kilometer-sized, which orbit pretty close to the rings, but outside. These very small bodies are known to us thanks to the Cassini spacecraft, and a recent study, which I present you today, has investigated their long-term evolution, in particular their stability. Are they doomed or not? How long can they survive? You will know this and more after reading this presentation of Long-term evolution and stability of Saturnian small satellites: Aegaeon, Methone, Anthe, and Pallene, by Marco Muñoz-Gutiérrez and Silvia Giuliatti Winter. This study has recently been accepted for publication in The Monthly Notices of the Royal Astronomical Society. As usually in planetary sciences, bodies are named after the Greek mythology, which is the case of the four satellites discussed today. But I must admit that I cheat a little: I present them as Alkyonides, while Aegeon is actually a Hecatoncheires. The Alkyonides are the 7 daughters of Alcyoneus, among them are Anthe, Pallene, and Methone. For comparison, Mimas orbits Saturn at 185,000 km, and the outer edge of the A Ring, i.e. of the main rings of Saturn, is at 137,000 km. So, we are in the close system of Saturn, but exterior to the rings. Discovery of Anthe, aka S/2007 S4. Copyright: NASA. Aegaeon is in the 7:6 MMR with Mimas. As we will see, these resonances have a critical influence on the long-term stability. Beside the main and well-known rings of Saturn, rings and arcs of dusty material orbit at other locations, but mostly in the inner system (with the exception of the Phoebe ring). In particular, the G Ring is a 9,000 km wide faint ring, which inner edge is at 166,000 km… Yep, you got it: Aegaeon is inside. Some even consider it is a G Ring object. 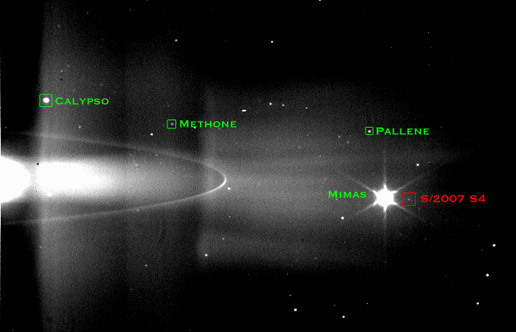 Methone and Anthe have dusty arcs associated with them. The difference between an arc and a ring is that an arc is longitudinally bounded, i.e. it is not extended enough to constitute a ring. The Methone arc extends over some 10°, against 20° for the Anthe arc. The material composing them is assumed to be ejecta from Methone and Anthe, respectively. However, Pallene has a whole ring, constituted from ejecta as well. Why sometimes a ring, and sometimes an arc? Well, it tell us something on the orbital stability of small particles in these areas. Imagine you are a particle: you are kicked from home, i.e. your satellite, but you remain close to it… for some time. Actually you drift slowly. While you drift, you are somehow shaken by the gravitational action of the other satellites, which disturb your Keplerian orbit around the planet. If you are shaken enough, then you may leave the system of Saturn. If you are not, then you can finally be anywhere on the orbit of your satellite, and since you are not the only one to have been ejected (you feel better, don’t you? ), then you and your colleagues will constitute a whole ring. If you are lucky enough, you can end up on the satellite. The longer the arc (a ring is a 360° arc), the more stable the region. the stability of the satellites in the system of Saturn over several hundreds of kilo-years (kyr). Comparing these two numbers. The smaller the difference, the more stable you are. The numerical simulations is something I have addressed in previous posts: you use a numerical integrator to simulate the motion of the particle, in considering an oblate Saturn, the oblateness being mostly due to the rings, and several satellites. Our four guys, and Janus, Epimetheus, Mimas, Enceladus, and Tethys. When a planetary body is trapped in a mean-motion resonance, there is an angle, which is an integer combination of angles present in its dynamics and in the dynamics of the other body, which librates. An example is the MMR Aegaeon-Mimas, which causes the angle 7λMimas-6λAegaeon-ϖMimas to librate. λ is the mean longitude, and ϖ is the longitude of the pericentre. Such a resonance is supposed to affect the dynamics of the two satellites but, given their huge mass ratio (Mimas is between 300 and 500 millions times heavier than Aegaeon), only Aegaeon is affected. The resonance is at a given location, and Aegaeon stays there. And in this particular region of the system of Saturn, there are many resonances, which means that the stability of the discovered body is not obvious. This is why the authors studied it. The authors find that Pallene cannot clear its ring efficiently, despite its size. Actually, this zone is the most stable, wrt the dynamical environments of Anthe, Methone and Aegaeon. However, 25% of the particles constituting the G Ring should collide with Aegaeon in 18 years. This probably means that there is a mechanism, which refills the G Ring. From long-term numerical simulations over 400 kyr, i.e. more than one hundred millions of orbits, these 4 satellites are stable. For Pallene, the authors guarantee its stability over 64 Myr. Among the 4, this is the furthest satellite from Saturn, which makes it less affected by the resonances. The authors mention as a possible perspective the action of the non-gravitational forces, such as the solar radiation pressure and the plasma drag, which could affect the dynamics of such small bodies. I would like to add another one: the secular tides with Saturn, and the pull of the rings. They would induce drifts of the satellites, and of the resonances associated. The expected order of magnitude of these drifts would be an expansion of the orbits of a few km / tens of km per Myr. This seems pretty small, but not that small if we keep in mind that two resonances affecting Methone are separated by 4 km only. This means that further results are to be expected in the upcoming years. The Cassini mission is close to its end, scheduled for 15 Sep 2017, but we are not done with exploiting its results! The study, here: https://doi.org/10.1093/mnras/stx1537, also made freely available by the authors on arXiv, thanks to them for sharing! The web page of Silvia Maria Giuliatti Winter. Hi there! Today I will tell you on the interior of Mimas. You know, Mimas, this pretty small, actually the smallest of the mid-sized, satellite of Saturn, which has a big crater, like Star Wars’ Death Star. Despite an inactive appearance, it presents confusing orbital quantities, which could suggest interesting characteristics. This is the topic of the study I present you today, by Marc Neveu and Alyssa Rhoden, entitled The origin and evolution of a differentiated Mimas, which has recently been published in Icarus. Others (to make sure I do not forget anybody, including the coorbital satellites of Tethys and Dione, Hyperion, the Alkyonides, Phoebe…). Discovered in 1789 by William Herschel, Mimas is the innermost of the mid-sized satellites of Saturn. It orbits it in less than one day, and has strong interactions with the rings. As we can see, Mimas has a significant eccentricity and a significant inclination. This inclination could be explained by a mean-motion resonance with Tethys (see here). However, we see no obvious cause for its present eccentricity. It could be due to a past gravitational excitation by another satellite. The literature is not unanimous on the formation of Mimas. It was long thought that the satellites of Saturn formed simultaneously with the planet and the rings, in the proto-Saturn nebula. The Cassini space mission changed our view of this system, and other scenarios were proposed. For instance, the mid-sized satellites of Saturn could form from the collisions between 4 big progenitors, Titan being the last survivor of them. The most popular explanation seems to be that a very large body impacted Saturn, its debris coalesced into the rings, and then particles in the rings accreted, forming satellites which then migrated outward… these satellites being the mid-sized satellites, i.e. Rhea, Dione, Tethys, Enceladus, and Mimas. This scenario would mean that Mimas would be the youngest of them, and that it formed differentiated, i.e. that the proto-Mimas was made of pretty heavy elements, on which lighter elements accreted. Combining observations of Mimas with theoretical studies of its long-term evolution could help to determine which of these scenarios is the right one… if there is a right one. Such studies can of course involve other satellites, but this one is essentially on Mimas, with a discussion on Enceladus at the end. The most striking discrepancy is at the period 22.4 h, which is the orbital period of Mimas. These oscillations are named diurnal librations, and their amplitude is very sensitive to the interior. Moreover, the amplitude associated is twice the predicted one. This means that the interior, which was hypothesized for the theoretical study, is not a right one, and this detection of an error is a scientific information. It means that Mimas is not exactly how we believed it is. The authors of the 2014 study, led by Radwan Tajeddine, investigated 5 interior models, which could explain this high amplitude. One of these models considered the influence of the large impact crater Herschel. In all of these models, only 2 could explain this high amplitude: either an internal ocean, or an elongated core of pretty heavy elements. Herschel is not responsible for anything in this amplitude. The presence of an elongated core would support the formation from the rings. However, the internal ocean would need a source of heating to survive. tides: i.e. internal friction due to the differential attraction of Saturn. This would be enforced by the variations of the distance Saturn-Mimas, i.e. the eccentricity. And this is how we arrive to the study: the authors simulated the evolution of the composition of Mimas under radiogenic and tidal heating, in also considering the variations of the orbital elements. Because when a satellite heats, its eccentricity diminishes. Its semimajor axis varies as well, balanced between the dissipation in the satellite and the one in Saturn. The authors show that in any case, the ocean cannot survive. If there would be a source of heating sustaining it, then the eccentricity of Mimas would have damped. In other words, you cannot have the ocean and the eccentricity simultaneously. Depending on the past (unknown) eccentricity of Mimas and the dissipation in Saturn, which is barely known, an ocean could have existed, but not anymore. 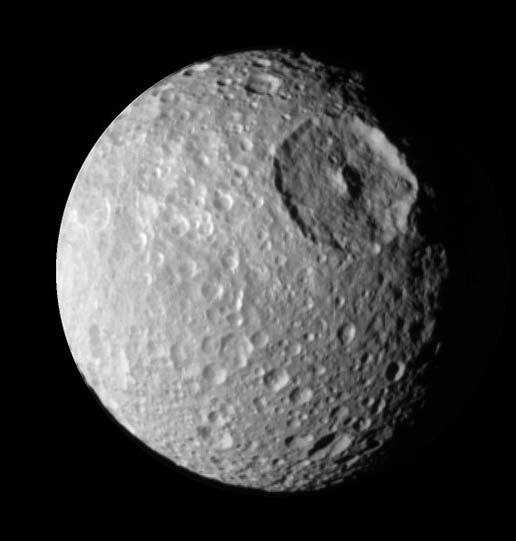 As a consequence, Mimas must have an elongated core, coated by an icy shell. The eccentricity could be sustained by the interaction with Saturn. This elongated core could have two origins: either a very early formation of Mimas, which would have given enough time for the differentiation, or a formation from the rings, which would have formed Mimas differentiated. 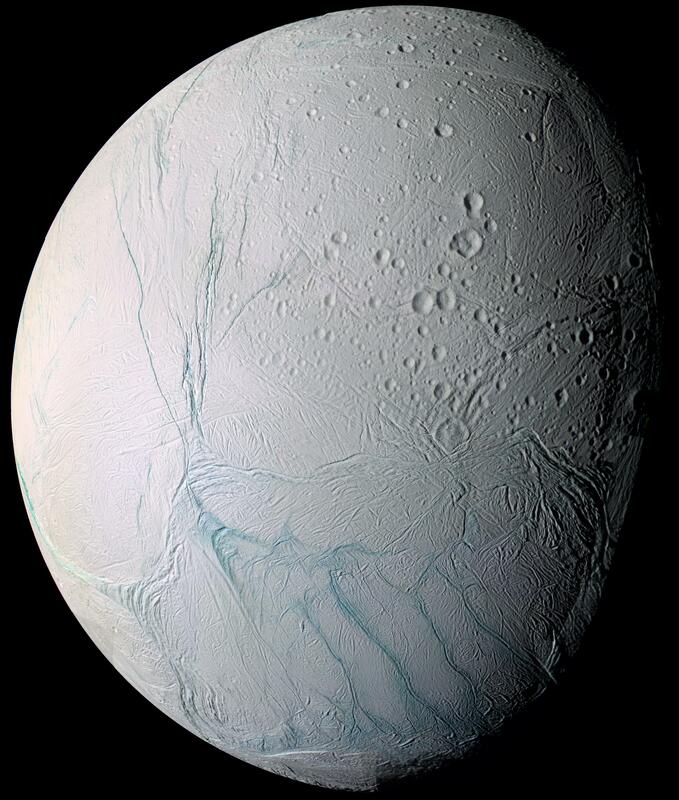 Finally the authors say that there model does not explain the internal ocean of Enceladus, but Marc Neveu announces on his blog that they have found another explanation, which should be published pretty soon. Stay tuned! The 2014 study measured a phase shift of 6° in the diurnal librations. This is barely mentioned in the literature, probably because it bothers many people… This is huge, and could be more easily, or less hardly, explained with an internal ocean. I do not mean that Mimas has an internal ocean, because the doubts regarding its survival persist. So, this does not put the conclusions of the authors into question. Anyway, if one day an explanation would be given for this phase lag, that would be warmly welcome! The study, here: http://www.sciencedirect.com/science/article/pii/S0019103516304250, shared by the authors here. They present there study here. The web page of Alyssa Rose Rhoden. You can also follow her on Twitter here. The code used by the authors. Thanks to them for sharing! Hi there! Today I will present you True polar wander of Enceladus from topographic data, by Tajeddine et al., which has recently been published in Icarus. The idea is this: Enceladus is a satellite of Saturn which has a pretty stable rotation axis. In the past, its rotation axis was already stable, but with a dramatically different orientation, i.e. 55° shifted from the present one! The authors proposed this scenario after having observed the distribution of impact basins at its surface. Enceladus is one of the mid-sized satellites of Saturn, it is actually the second innermost of them. It has a mean radius of some 250 km, and orbits around Saturn in 1.37 day, at a distance of ~238,000 km. It is particularly interesting since it presents evidence of past and present geophysical activity. In particular, geysers have been observed by the Cassini spacecraft at its South Pole, and its southern hemisphere presents four pretty linear features known as tiger stripes, which are fractures. Enceladus seen by Cassini (Credit: NASA / JPL / Space Science Institute). Moreover, analyses of the gravity field of Enceladus, which is a signature of its interior, strongly suggest a global, subsurfacic ocean, and a North-South asymmetry. This asymmetry is consistent with a diapir of water at its South Pole, which would be the origin of the geysers. The presence of the global ocean has been confirmed by measurements of the amplitude of the longitudinal librations of its surface, which are consistent with a a crust, that a global ocean would have partially decoupled from the interior. Planetary satellites have a particularly interesting rotational dynamics. Alike our Moon, they show on average always the same face to a fictitious observer, which would observe the satellite from the surface of the parent planet (our Earth for the Moon, Saturn for Enceladus). This means that they have a synchronous rotation, i.e. a rotation which is synchronous with their orbit, but also that the orientation of their spin axis is pretty stable. And this is the key point here: the spin axis is pretty orthogonal to the orbit (this orientation is called Cassini State 1), and it is very close to the polar axis, which is the axis of largest moment of inertia. This means that we have a condition on the orientation of the spin axis with respect to the orbit, AND with respect to the surface. The mass distribution in the satellite is not exactly spherical, actually masses tend to accumulate in the equatorial plane, more particularly in the satellite-planet direction, because of the combined actions of the rotation of the satellites and the tides raised by the parent planet. This implies a shorter polar axis. And the study I present today proposes that the polar axis has been tilted of 55° in the past. This tilt is called polar wander. This result is suggested by the distribution of the craters at the surface of Enceladus. The Solar System bodies are always impacted, this was especially true during the early ages of the Solar System. And the inner satellites of Saturn were more impacted than the outer ones, because the mass of Saturn tends to attract the impactors, focusing their trajectories. As a consequence, Enceladus got heavily impacted, probably pretty homogeneously, i.e. craters were everywhere. And then, over the ages, the crust slowly went back to its original shape, relaxing the craters. The craters became then basins, and eventually some of them disappeared. Some of them, but not all of them. The process of relaxation is all the more efficient when the material is hot. For material which properties strongly depend on the temperature, a stagnant lid can form below the surface, which would partly preserve it from the heating by convection, and could preserve the craters. This phenomenon appears preferably at equatorial latitudes. This motivates the quest for basins. A way for that is to measure the topography of the surface. The surface of planetary body can be written as a sum of trigonometric series, known as spherical harmonics, in which the radius would depend on 2 parameters, i.e. the latitude and the longitude. This way, you have the radius at any point of the surface. Classically, two terms are kept, which allow to represent the surface as a triaxial ellipsoid. This is the expected shape from the rotational and tidal deformations. If you want to look at mass anomalies, then you have to go further in the expansion of the formula. But to do that, you need data, i.e. measurements of the radius at given coordinates. And for that, the planetologists dispose of the Cassini spacecraft, which made several flybys of Enceladus, since 2005. Two kinds of data have been used in this study: limb profiles, and control points. Limb profiles are observations of the bright edge of an illuminated object, they result in very accurate measurements of limited areas. Control points are features on the surface, detected from images. They can be anywhere of the surface, and permit a global coverage. In this study, the authors used 41,780 points derived from 54 limb profiles, and 6,245 control points. Measuring the shape is only one example of use of such data. They can also be used to measure the rotation of the body, in comparing several orientations of given features at different dates. These data permitted the authors to model the topography up to the order 16. The authors identified a set of pretty aligned basins, which would happen for equatorial basins protected from relaxation by stagnant lid convection. But the problem is this: the orientation of this alignment would need a tilt of 55° of Enceladus to be equatorial! This is why the authors suggest that Enceladus has been tilted in the past. The observations do not tell us anything on the cause of this tilt. Some blogs emphasize that it could be due to an impact. Why not? But less us be cautious. Anyway, the orientation of the rotation axis is consistent with the current mass distribution, i.e. the polar axis has the largest moment of inertia. Actually, mid-sized planetary satellites like Enceladus are close to sphericity, in the sense that there is no huge difference between the moments of inertia of its principal axes. So, a redistribution of mass after a violent tilt seems to be possible. The study, on Icarus’s website. Another post on this research, on Saturn Daily. The announcement of this discovery on the sites of Cornell University and NASA. A preliminary communication of the study. A cartoon by James T. Keane illustrating this study. The webpage of Radwan Tajeddine. The webpage of Krista M. Soderlund. The webpage of Peter C. Thomas. The webpage of Paul Helfenstein. The webpage of Matthew M. Hedman. The webpage of Joseph A. Burns. The webpage of Paul M. Schenk.